Reveal Highlight is a lighting effect that highlights interactive elements, such as command bars, when the user moves the pointer near them. By exposing the hidden borders around objects, Reveal gives users a better understanding of the space that they are interacting with, and helps them understand the actions available. This is especially important in list controls and groupings of buttons. If you have the XAML Controls Gallery app installed, click here to open the app and see Reveal in action. Reveal automatically works for some controls. For other controls, you can enable Reveal by assigning a special style to the control, as described in the Enabling Reveal on other controls and Enabling Reveal on custom controls sections of this article. If you have a scenario where Reveal should be applied (these controls are main content and/or are used in a list or collection orientation), we've provided opt-in resource styles that allow you to enable Reveal for those types of situations. Reveal changes slightly depending on the requested theme of the control, app or user setting. 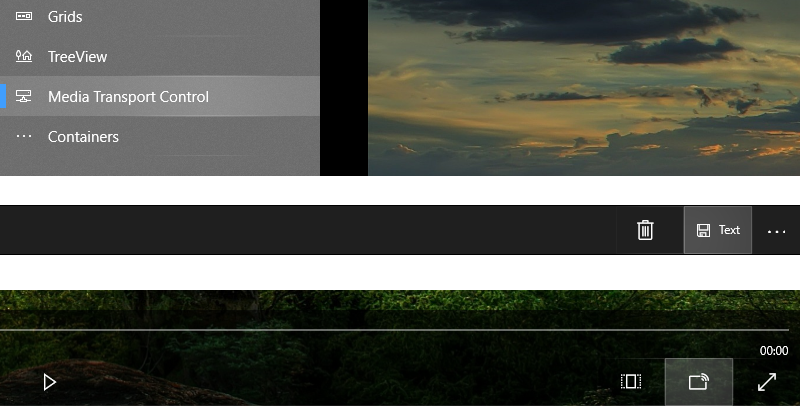 In Dark theme Reveal's Border and Hover light is white, but in Light theme just the Borders darken to a light gray. To enabled white borders while in light theme, simply set the requested theme on the control to Dark. Or change the TargetTheme on the RevealBorderBrush to Dark. Remember! If the TargetTheme is set to Dark, then Reveal will be white, but if it's set to Light, Reveal's borders will be gray. You can add Reveal to custom controls. Before you do, it's helpful to know a little more about how the Reveal effect works. Reveal is made up of two separate effects: Reveal border and Reveal hover. Border shows the borders of interactive elements when a pointer is nearby by. This effect shows you that those nearby objects can take actions similar to the one currently focused. Hover applies a gentle halo shape around the hovered or focused item and plays a press animation on click. In most cases we handle the usage of both of them by turning Reveal on automatically for a certain controls. However, other controls will need to be enabled through applying a style, or changing their templates directly. You can add Reveal to your custom controls--but before you do, consider the type of control and how it behaves. If your custom control is a single interactive element and doesn't have similar controls sharing it's space (such as menu items in a menu), it's likely that your custom control doesn't need Reveal. If you have a grouping of related interactive content or elements, then it's likely that that region of your app does need Reveal - this is commonly referred to as a Commanding surface. For example, a button by itself shouldn't use reveal, but a set of buttons in a command bar should use Reveal. It's important to note that Reveal needs both the brush and the setters in it's Visual State to work correctly. Simply setting a control's brush to one of our Reveal brush resources alone won't enable Reveal for that control. Conversely, having only the targets or settings without the values being Reveal brushes will also not enable Reveal. To learn more about modifying control templates, see the XAML control templates article. On adjacent items with sizes that do not align either in height or width (particularly in lists): Remove the border approach behavior and keep the borders shown on hover only. For commanding items that frequently go in and out of the disabled state: Place the border approach brush on the elements' backplates as well as their borders to emphasize their state. For adjacent commanding elements that are so close they touch: Add a 1px margin between the two elements. The Fluent Design System helps you create modern, bold UI that incorporates light, depth, motion, material, and scale. 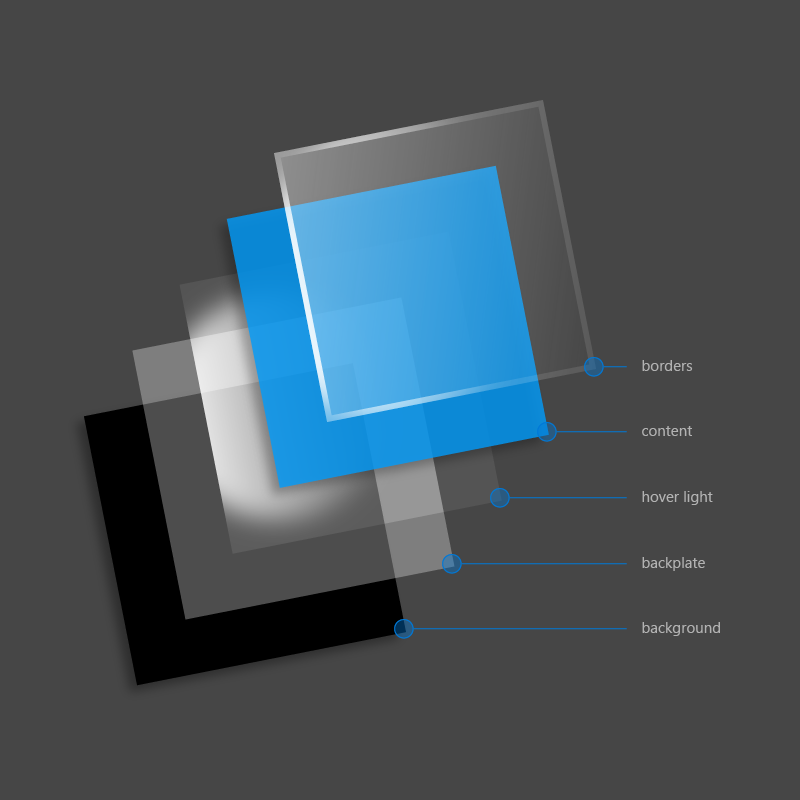 Reveal is a Fluent Design System component that adds light to your app. To learn more, see the Fluent Design for UWP overview.